For the novice, the word “propagation” can seem a bit intimating. After all, it sounds so scientific. If you’re interested in dipping your toe into the world of plant propagation (and we are talking plants here), there is no easier plant to start with than the lovely African violet. Although she’s been gone for many years, I always associate African violets with my grandmother. She always had pots of blooming violets on her windowsills. Now, I almost always have some violets growing in my light garden or the windowsills. I continually propagate them and have some ready for giving away for special occasions. I will also group them on the dining table for a live flower arrangement that doesn’t cost a fortune or require loads of chemicals at the flower farm. Recently, I took one of the prettiest of my violets to my Great Aunt Maxine for her 90th birthday celebration. While I was at her house I noticed she had some violets of her own. What better opportunity to add to my collection in a meaningful way? She supplied a baggie and I loaded up with new cuttings. To propagate your African violet, select a leaf that is not too big and not too small. You don’t want an old gnarly leaf or one that is too tiny. Select a medium-sized, vigorous leaf and cleanly slice it off the plant, leaving about 1” of stem. Now, here’s the hard part. It seems counter-intuitive, but you’re going to have to cut the leaf in half, leaving about 1” of leaf on the stem. My grandmother used to root her cuttings in plain water, suspending them through a hole in some aluminum foil. This works just fine. But a better, and faster, way is to root the cutting directly in some soilless medium. This is typically available as African violet soil in nurseries. I can find it in my local grocery store. Give your cuttings a head start by using a rooting hormone, such as Rootone. Just dip the stem end into the rooting hormone powder before planting the stem in some soilless medium. Since the plants don’t have roots, it’s important to keep the cutting moist. I just pop a plastic bag over the top of the pot to retain moisture and make sure I water regularly. In your zeal for moisture, don’t overly seal the plant in or you’ll be creating an environment where diseases can flourish. Plants need light to grow, so make sure you provide adequate light. A sunny windowsill in the winter will do the trick. In the summer, you’ll need to make sure the sun isn’t too intense or the leaves will burn and the soil medium will dry out too quickly. I find that my light garden provides the perfect environment for propagating and keeping live plants. -When propagating or repotting, use African violet potting soil. It’s soilless, so it’s lighter, doesn’t compact and gives the aeration and drainage that the African violets need. Violets do just fine in the temperatures of the average household—65 to 73 degrees. -Avoid getting leaves wet when watering to prevent discoloration. Are you violets dusty? Just use a soft-bristled paintbrush to brush off dust or accumulated dirt. 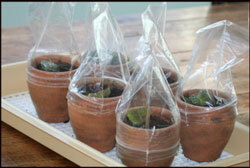 -Nurseries sell specialized African violet pots with an inner and outer layer for indirect watering. I have never had as much success with this method as with traditional terra cotta pots. My favorite pots are by Guy Wolff. Large Guy Wolff pots can be expensive, but the tiny ones are very reasonable—and just the right thing to give your African violets a good start in life. Interested in the African violet lifestyle? There is a whole society devoted to the promoting African violets, the African Violet Society. I remember when we used to live in Florida there was a local African violet club that got together monthly to talk about their violets. They also had annual competitions at the local fair. Next to the chicken displays, this was always my favorite part of the fair. Isn’t it amazing that there is a special interest group for everything? Great post, Robin! I love African violets, but managed to kill all of mine after we brought our first baby home from the hospital. This makes me want to go out and buy a few! I love AV but they don’t like our house. Our window sills are too skinny and the gardener doesn’t water correctly. I love to see them though and as you say they are easy to start. Thank you. I was missing a piece of the puzzle. I had to save an overwatered root rotted violet for my sil. We just put the base of the plant in water and let it recreate it’s own rotted roots, which worked. I did take two leaf cuttings, but did not cut them in half. They did not take. Thank you for the tips on propagating African Violets. I used to grow them, but haven’t for several years. Your post is inspiring me to add some – I am in need of all the flower colour I can get these days! I like the idea that you took some cutting from your aunt – a perfect passalong plant that will always remind you of her. What a great step-by-step for growing some AVs from a friends cutting. I can’t wait to get started! Good info. I’ve always been fascinated by the ladies of the local African violet society who sell hundreds of AV’s at the local flower and patio show in the spring. I’m rooting some cuttings, now, too. Though I don’t know what I’ll do with all the new plants I’ll get! Talk about synchronicity…I just fessed up to bringing home a few African violets, and posted a bit of info on growing them too. But I don’t propogate them…no room…that’s my story, really! Great post. I’m teaching beginning botany to my children this year. What a great project idea. Very good information! I just picked up an African Violet over Christmas. Two of the leaves became separated from the rest of the plant so I just stuck them in the side of the container. When I replanted them the other day both had grown roots. I didn’t cut them in half but that can be necessary when propagating plants. Any chance you could try to identify the african violet I got in the late 1980’s? I tried looking at the registered names for those years and couldn’t find anything that seemed right. I posted a photo on my blog: http://wellspringcreations.blogspot.com/. Much appreciated. If this plant can survive what I’ve done to it, it deserves it’s name! some of the “pros” say the rooting hormone isn’t necessary, and could in some cases cause problems. I have never used it with AV leaves so I can’t say. You also have them in very big pots! That leaves alot of wet soil surrounding what will in the beginning be a very very small root system – could lead to root rot. You are obviously experienced and this works for you, perhaps the clay pots keep the soil from getting too soggy, and you never have to move the plants into bigger pots..for beginners, might be better to use little pots, like the 2 inch size that little cacti or sedum come in, or poke holes in the bottoms of the little plastic bathroom cups from “Solo” that you can buy by the dozens in the grocery store. Then you can set the whole thing inside a ziploc bag and zip the top. After the baby plants leaves are roughly the size of nickels, you can repot into a larger size. I love African violets but have never tried to grow them. Our sunroom gets the morning and afternoon sun and makes it impossible to keep the mini-blinds open. When the blinds are open, we get all the reflections of the houses behind us and around us. I think it really would be a great place to raise house plants but wonder if it might be too hot. Your instructions make it sound so simple. 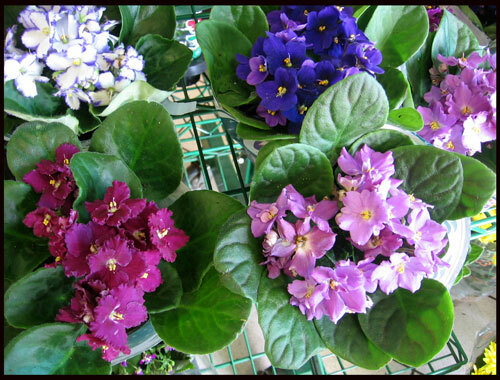 I am so glad to stumble upon your blog while Google-ing for African Violet! I also love gardening and enjoy reading your gardening adventure! .-= JC´s last blog ..SS2 Morning Market =-.